I dragged this novel along to a temp job where I was reception relief and my only responsibility was transferring incoming calls. ‘The computer is solely for your enjoyement’ I quote my trainer as she waved to the solitaire game she was playing when I arrived. So, after I got bored of solitaire and Facebook, I presumed reading would be OK and dug The Help out of my bag, worrying about how I would become immersed in a book amidst multiple interruptions. I worried needlessly. The fact that I had to tear my eyes away from the pages numerous times and it still didn’t prevent me from becoming immediately absorbed in this story is evidence of what an easy read The Help is as well as how captivating and entertaining it is right from the first page. I enjoyed it so much I grew aggravated when the phone rang and my dialing skills improved with each call so I could get back to reading. I read over 150 pages that afternoon. The Help is all plot and character. There is little description besides character’s observations which is my perfect read. The potential of danger lurking made this a tense read at times and yet I laughed frequently, which surprised me the most about this immensely enjoyable tale. The characters, oh, the characters. Such incredibly vivid, amazing, colourful women graced these pages. They felt so real that I thought they would jump off the page at me. Written from three women’s perspectives, I wasn’t at all discouraged as the story flipped around to each narrator. We see the world from Minnie’s feisty point of view and Skeeter’s humanitarian and questioning eyes as well as my favourite, Aibileen, whose love for little Mae Mobbley knows no bounds even though she knows she’s going to have to leave her eventually. My heart ached with their every scene. This story was so thought provoking and contained such a wonderful commentary on women and friendship and trust and love. Although Stockett could have taken this novel in terrifying directions, she didn’t. Instead, while maintaining a strong undercurrent of danger, she kept the story uplifting and upbeat. She focused on the strength of these women, their tenacity, hope and courage and I adored the focus on the good lurking behind closed doors. My favourite line was also Stockett’s favourite which addresses female relationships. No spoilers here as it’s towards the end of the novel. You’ll just have to find it yourself…or if you need a little help it’s addressed in the afterward. 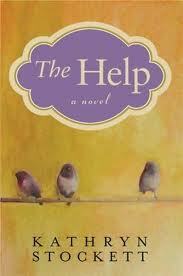 So, if you’ve been holding off on reading The Help because you don’t think it will live up to the hype, don’t. This is the kind of novel that hits with a solid punch and won’t be forgotten easily. I will definitely remember this novel forever. That is exactly how I felt about this one too! Definitely one of my favourites.